When considering a Montessori education for your child, it’s important to discover a little bit about the history of Montessori and how the method came to be. Developed over 100 years ago, the Montessori Method was the product of years of research conducted by the Italian physician, educator, and innovator Dr. Maria Montessori. From an early age, Maria proved her thirst for knowledge by entering into an all-boys technical institute at the age of 13 to prepare for a career in engineering. She later changed her mind and decided to become a doctor instead. Eventually, she was accepted into the University of Rome’s medical program, which opened the door for future women in the field. In 1896, Maria graduated from medical school, becoming one of Italy’s first female physicians. Her interest in education developed during the early years of her psychiatry focused medical practices. She attended classes on pedagogy and immersed herself in educational theory. Through her studies, Montessori was able to observe and call into question the widely established methods of teaching children with intellectual and developmental disabilities. In 1900, Maria Montessori was appointed co-director of a new training institute for special education teachers. Through this institute, Maria was able to further her observations and experiment with different teaching methods to see which ones worked best. The program ultimately proved to be successful with many of the children making unexpected developmental advances. A few years later in 1907, Dr. Montessori opened her first Montessori school – the Casa dei Bambini, or Children’s House – in a poor inner city district of Rome. Using her prior scientific observations and experiences, Montessori was able to design a high-quality classroom environment complete with a variety of learning materials that fostered the children’s natural desire to learn. 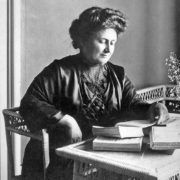 Dr. Montessori dedicated the rest of her life to perfecting her child-centered approach to learning. She held a series of lectures, wrote articles and books, and created a program for teachers to learn how to apply the Montessori Method. Due to her efforts and the work of her devoted followers, Montessori education spread internationally. Although many Montessori schools in the United States are privately owned, there are a growing number of Montessori programs that can be found within the public school systems. These programs, in both private and public schools, come in many shapes and sizes, from small infant or early-childhood classrooms to larger elementary, junior high, or high school classes.